Serenity, tranquility - ideal seniors' retreat! 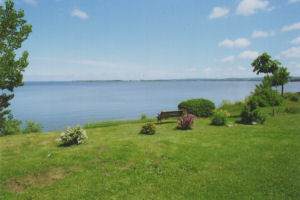 Well appointed two-bedroom cottage north central Nova Scotia on the western shore of the beautiful and historic Minas Basin "Evangeline Land". 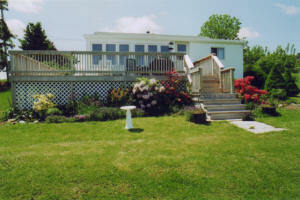 Full kitchen with side-by-side refrigerator/freezer, living-dining room, washer and dryer. 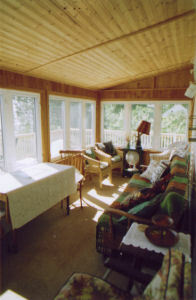 Enclosed seaside viewing sun room with spectacular viewing of world's highest tides. Initial bedding and towelling supplied. Own beach access. 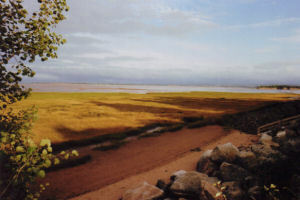 Near Wolfville, Acadia University, historic sites of Annapolis Valley. Easy drive to Bay of Fundy shore, Halifax, and South Shore scenery. Golf, swimming, kayaking, hiking, country walking and biking - theatre, dining, geneology, photography, geology, birding and gardens. Enjoy season fruits and vegetables of Annapolis Valley. Apple Blossom last of May, Rhododendron-Azalea show mid-June, Parade of Sail 2009 Halifax in July. Weekly rental is from Sunday at 4 pm until Sunday morning at 11 am. Own stairway to beach where there is High Tide twice a day.